The Atacama Desert of Chile covers the northern third of the country stretching more than 600 miles (1,000km), and straddles the southern border of Peru. Bound on the west by barren hills and mountains on the Pacific coast, it extends east into the Andes Mountains. At an average elevation of about 13,000 feet (4 kilometers) it is not only the highest desert in the world, but also one of the coldest, with temperatures averaging between 0°C-25°C. 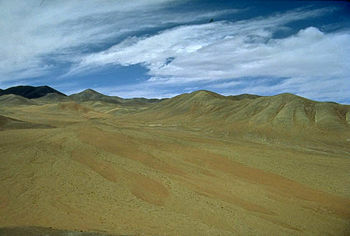 The center of the Atacama, a place climatologists refer to as "absolute desert," is known as the driest place on Earth. For as long as people have been recording rainfall, none has ever been measured in this area. There are some sections of the desert with an annual average rainfall of 0.6 mm to 2.1 mm, allowing for only sparse vegetation. Though limited, the existence of plant and animal life in such a harsh environment testifies to adaptability and determination to survive. Despite extremes and desolation there is stunning beauty. With the Andes as a backdrop the desert contains five snow topped volcanoes, which are the highest volcanoes in the world and the highest elevations in South America. Sparsely populated and virtually rainless, the Atacama Desert forms a narrow strip on the coast of Chile, between 600—700 miles long. The average width, from the Pacific Ocean on the west, to the Andes Mountains on the east, is less than 60 miles (100 km). 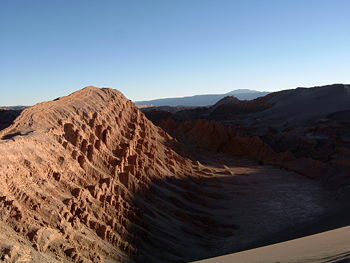 The north end of the desert lies at Chile's border with Peru, while the south stretches to the bend of the Loa River and the mountains separating the Salado-Copiapó drainage basins. The average rainfall in the desert ranges from 0.6 mm (in Arica) to 2.1 (in Iquique). However, there are some areas which have never recorded rainfall. Dr. Tibor Dunai, who spoke before the American Geophysical Union, told the BBC in a news article: "We found loose sediment surfaces that would be washed away by any desert rainfall and these are older than 20 million years," he said. This is much older than other hyper-arid regions, such as the Dry Valleys of Antarctica (10-11 million years) and the Namib Desert in Africa (5 million years). "The origin of the aridity in the Atacama dates back to the opening of ocean pathways—the opening between South America and Antarctica, and between Australia and the Antarctic. What are known as "fog-zone plant communities" have developed due to the entrapment of clouds by mountains or steep coastal slopes. These communities lie near the coast and in lower portions of numerous gorges between sea level and 1,100 m. Short-lived perennial and woody scrub vegetation grow there. Other areas receive marine fog, providing sufficient moisture for hypolithic algae, lichens, and even some cacti. In these areas, even decomposition does not occur. Dead vegetation may be thousands of years old. A recent innovation has made it possible to catch water from the air. With the use of mesh nets, water is trapped and trickled off via piping into storage tanks. In the southern desert, fog-zone vegetation supports approximately 230 species of vascular plants. Included are the dominant species of Euphorbia lactiflua and Eulychnia iquiquensis. Other shrubby species in the zone include Echinopsis coquimbana, Oxalis gigantea, Lycium stenophyllum, Proustia cuneifolia, Croton chilensis, Balbisia penduncularis, and Tillandsia geissei. Bromeliads are also present along the coastal flats in this southern part, and include Deuterocohni chrysantha and Puya boliviensis. Astrobiologists are studying the Atacama to discover clues which may unlock secrets of life on other planets and the possibility of survival there. They are also studying the growth of plants in extreme places in order to develop plants that could be grown off—world. 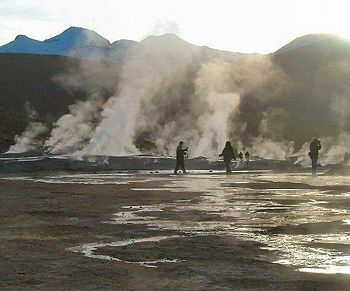 The plant and animal life in the Atacama survive under perhaps the earth's most demanding conditions. There is a high incidence of endemic flora. Local populations have relied on some of the species for medicinal purposes for generations. Approximately 550 species of vascular plants have been discovered in the Atacama, the most diverse being the families of Asteraceae, Nolanaceae, Cataceae, Boraginaceae, and Apiaceae. Three cacti are endemic to the northern part of the Atacama Desert; they are Eulychnia iquiquensis, Neoporteria sensu, and Copiapoa. There are also numerous endemic shrubs. Animal life is very rare in this desert, though there are a few insects and lizards to be found. Mice and fox are also present, but in small number. The fog-zone plant communities, or lomas, provide a friendlier environment. Birds such as the Peruvian song-sparrow, Pacific blue-black grassquit, and hummingbirds live there, for at least a portion of the year. Six restricted species can be found in the north region: Thick-billed miner, white-throated earthcreeper, cactus canastero, Chilean woodstar, slender-billed finch, and the tamarugo conebill, the latter three of which are considered threatened species. The Atacama was one of Chile's chief sources of wealth until World War I. Prior to that time, that nation had a monopoly on the nitrate trade worldwide. Three million tons were extracted in some years. The taxes alone on these exports amounted to 50 percent of the government's revenues. Since that time, sulfur has been mined, as well as copper, which is the region's chief source of revenue, providing over 30 percent of the world's copper supply. 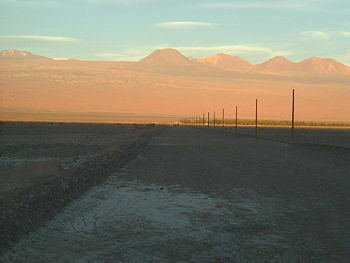 The Atacama border dispute between Chile and Bolivia began in the 1800s over these resources. The coastal cities of Iquique, Caldera, Antofagasta, Taltal, Tocopilla, Mejillones, and Pisagua have ports, while railroads cut through the mountain barriers to the interior. The environment offers little support to agriculture, but some farming is done near the river oases. Lemons are grown on the shores of the salt marshes, while potatos and alfalfa are grown near the Loa River. Currently, the Atacama Desert is littered with approximately 170 abandoned nitrate (or "saltpeter") mining towns, almost all of which were shut down decades after the invention of synthetic nitrate in Germany at the turn of the twentieth century. Some of these abandoned towns include Chacabuco, Humberstone, Santa Laura, Pedro de Valdivia, Puelma, Maria Elena and Oficina Anita. Chacabuco is a special case, since it was later converted into a concentration camp during Pinochet's regime. To this day it is surrounded by 98 lost landmines and is guarded by one man, who lives there alone. Of archaeological importance are the lomas formations. These beautiful and rare sites draw both tourists as well as scientists wishing to study the area. Environmentalists are concerned that the public has not been educated sufficiently enough to understand the delicate balance that is needed in this environment. Roads and mining operations have caused some damage. Overgrazing of domestic livestock has occurred in the north, as has commercial gathering of rare plants, including cacti and bulbs. The area of Quebrada El León has been overused, but with an opportunity for recuperation, could become a valuable nature reserve, providing for further study and pleasure. Pan de Azúcar National Park was established in 1986 and covers 438 km². It has been recommended that this area be expanded to allow for further protection. Pampa del Tamarugal National Reserve is one of the key areas for the conservation of the threatened tamarugo conebill. La Chimba National Reserve was most recently established. Most threats to this ecoregion are closely associated increased urbanization, pollution, road construction, livestock grazing, fuelwood gathering, commercial plant collecting, and erosion. Archaeological evidence indicates that the San Pedro area was the center of a Paleolithic civilization that built rock fortresses on the steep mountains encircling the valley. The Atacameños, an extinct Native culture different from that of the Aymaras to the north and the Diaguitas to the south, were the original inhabitants of the Atacama. The Atacama is sparsely populated today, with less than one million inhabitants in its 40,600 square miles (105,200 square kilometers). The populations are centered in the coastal cities, fishing villages, oasis communities and scattered mining camps. In the altiplano, the descendants of the region's pre-Columbian natives (mostly Aymara and Atacama Indians) herd llamas and alpacas and grow crops with water from snowmelt streams. Border disputes filled much of the nineteenth century, between the nations of Chile, Bolivia, and Peru. This was due to the abundance of mineral resources, particularly sodium nitrate. The mining industry was controlled by Chile and Great Britain, though the area itself was owned by Bolivia and Peru. The disputes eventually erupted into the War of the Pacific, which raged from 1879 to 1883. The Treaty of Ancón of 1883, gave Chile permanent ownership of areas previously controlled by Peru and Bolivia. Bolivia lost its entire Pacific coastline, becoming a landlocked nation. Aarons, John and Claudio Vita-Finzi. The Useless Land: A Winter in the Atacama Desert. London: R. Hale, 1960. Armstrong, Sean. Atacama desert, World Wildlife Fund. Retrieved June 25, 2007. Dillon, M.O., and A.E. Hoffmann-J. "Lomas Formations of the Atacama Desert Northern Chile." Centres of Plant Diversity: A guide and Strategy for their Conservation. World Wildlife Fund. Oxford: IUCN, 1997. Encyclopædia Britannica. 2007. Atacama Desert, Encyclopædia Britannica Online. Retrieved June 25, 2007. Lustig, L. K. "Appraisal of research on geomorphology and surface hydrology of desert environments." Deserts of the World: An Appraisal of Research into Their Physical and Biological Environments. Tuscon: University of Arizona Press, 1970. Roig, V. Atacama Desert. Norman, Oklahoma: University of Oklahoma Press, 1999. Vesilind, Priit J. Parts of Chile's Atacama Desert haven't seen a drop of rain since recordkeeping began. Somehow, more than a million people squeeze life from this parched land, National Geographic. Autonomous Robot Finds Life in Atacama Desert, Slash Dot. Amos, Jonathan. Chile desert's super-dry history, British Broadcasting Corporation. December 8, 2005. This page was last modified on 22 April 2016, at 15:11.